Seeing Ilham Aliyev swap his usual suit and tie with white robes for a pilgrimage to Mecca this April was rather surprising. After all, Aliyev, the president of energy rich Azerbaijan and a child of Soviet era, with his glamour conscious wife and daughters, is rarely seen observing religious traditions—let alone travelling to Mecca to visit the Kaaba, the holiest of sights in Islam. Whatever the outcome, religious sentiments are undoubtedly on the rise in Azerbaijan. Azerbaijan's Muslims belong to various denominations—roughly 85 per cent Shia and 15 per cent Sunni, as well as a significant group of Azerbaijanis who describe themselves simply as 'Muslims', complying with very few religious regulations. Poor economic conditions, endemic corruption and the vacuum of other missing ideological alternatives leave Azerbaijanis with nowhere else to turn for hope—save religion. But the government is yet to address many religious grievances in an open and transparent matter, pushing some to the margins or even underground. Much depends on the path Aliyev's government chooses to take. Islam did not gain mass popularity in Azerbaijan until the collapse of the Soviet Union. Economic difficulties and humanitarian grievances made people look for other alternatives to fill the void. Religion presented an opportunity to reconnect with the country’s Islamic roots, condemned under the Soviet Union. In 1992, the newly elected Popular Front government and its leader Abulfaz Elchibey declared the country a secular state, despite it being majority Muslim, underestimating the power of religious aspirations. Elchibey, who was post-communist Azerbaijan's first democratically elected president, brought with him a secular nationalist ideology adopted from Turkey, but the ideological vacuum left from the Soviet collapse was still very much present. Even if supported by the ruling government at the time, Turkish-inspired secular nationalism wasn't alone in proselytising in the young republic. Religious heritage and historically strong ties contributed to influence from Azerbaijan's southern neighbour Iran as well as the Arab states. Given the government's failure to provide alternative narratives to the deeply embedded Soviet ideology, the opportunity was ripe. The only powerful narrative which later emerged was the 'cult of personality' introduced by third President Heydar Aliyev, later expanded by his son and current ruler Ilham Aliyev. By the mid to late 1990s, Azerbaijan was very much divided between various Islamic denominations. Moderate Shia faced radical Shia congregations who refused to recognise the state's jurisdiction over religious affairs. Salafi and radical Wahabbi congregations came into being, and the [mainstream] Sunni community was influenced heavily by Turkey. Until the 1990s, no one had heard of Salafism in Azerbaijan. Wahabbism, a strongly anti-Shia school of thought and radical wing of Salafi Islam, gained popularity in Azerbaijan's northern regions, especially among the Sunni Lezgi minority, but also in the capital of Baku. 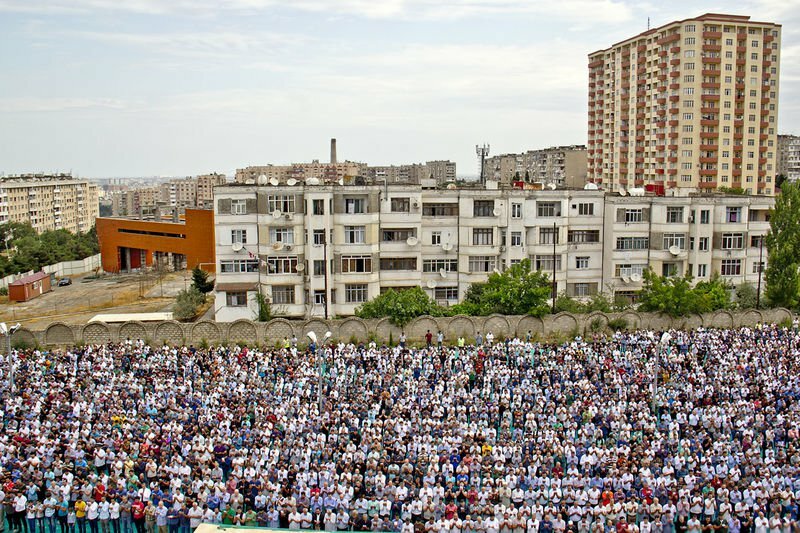 More moderate Salafi believers often gathered at the Abu Bakr mosque in Baku to listen to the imam Hadji Gamet Suleymanov, who often condemned poverty, corruption and social injustice. People celebrate Day of Ashura in Gyanja, Azerbaijan, by giving blood. (c) Binnat Ismailov / Demotix. Nevertheless, the government of Azerbaijan always viewed Salafi Islam as a threat. The government's disproportional and violent methods (raiding the main mosque, forcefully shaving beards in public) pushed this group's adherents underground. However, outside of Baku the situation for Salafis is easier. 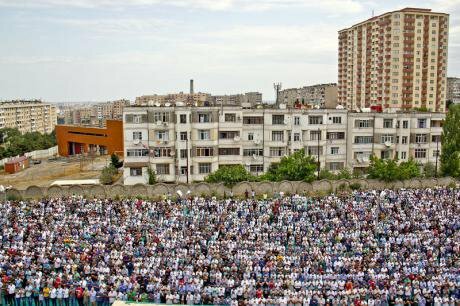 During a recent visit to Azerbaijan's regions, Altay Goyushov, a professor of theology and expert on Islam, observed that followers of Salafism were well established and very much active in the regions. Iranian initiatives sprung up in the early 1990s, with Iran sponsoring religious schools and sending missionaries across the border to southern Azerbaijan. By the late 1990s, many Iranian mullahs had been expelled by order of the late President Heydar Aliyev, and most madrasas (religious schools) were banned. However, Iran continued to influence religious life inside Azerbaijan through mullahs trained in Iran. These mullahs, such as Taleh Bagirzade or Ilgar Ibrahimoğlu, were sympathetic to the Iranian theocratic regime. Ibrahimoğlu, an Islamic scholar, attracted a different kind of pro-Iranian Shia Muslim congregation. Ibrahimoğlu combined Islamic values with democratic rhetoric, which made him extremely popular among educated youth. Ibrahimoğlu himself was educated in the Shia holy city of Qom and studied human rights in Poland. Meanwhile, Taleh Bagirzade, another charismatic Imam, attracted crowds through his fiery sermons heavily critical of the government of Azerbaijan. Following one such sermon in 2013, Bagirzade landed in jail with a two-year sentence on charges of drug possession. Despite his recent release Bagirzade has already been questioned on two separate occasions. On his last visit to the local police station in a town outside Baku, Bagiradze discovered that somebody had tipped off the police about his presence, accusing him of traveling to town to deliver an anti-government sermon. The pro-Turkish Sunni presence in Azerbaijan is visible in two forms: through the Turkish Directorate of Religious Affairs in Turkey and Cağ Oğretim A.S., a company associated with the US-based cleric Fethullah Gülen. The former financed the construction of several mosques (all of which have since been closed), and the latter operated and financed a network of schools, one university and a theology faculty at Baku State University. Since Azerbaijan gained independence in 1991, Cağ Oğretim has founded total 11 schools, one university (the private Baku-based Caucasus University), and 13 university prep centres. However, this situation changed in 2013: the State Oil Company of Azerbaijan (SOCAR) took over all Cağ Oğretim schools, aside from the university, and renamed them as the Baku International Education Center. While SOCAR representatives never elaborated on their decision to take over the schools' management, observers linked the decision to the souring of relations between Turkey's then Prime Minister Recep Tayyip Erdoğan and Gülen. Since Turkey's 2013 Gezi Park protests, Erdoğan, now president, has accused the Gülen movement of running a 'parallel state' to overthrow the government of the ruling AKP (Justice and Development) party. At a cabinet meeting last April, Erdoğan mentioned a list of alleged Gülen supporters in Azerbaijan, which he asked Azerbaijani officials to carefully examine. As a result, pro-government media outlets shunned certain officials for their ties with Erdoğan's new enemy, which had supposedly 'infiltrated' Azerbaijan's state institutions. Beyond Turkey, the government continues to exercise control over any possible radical religious formations. The Caucasus Muslim Board, the government body dealing with religious groups, is a close ally of the ruling elite: its leader Sheikh Allahshukur Pashazade is a known government loyalist. Since 2009, the government of Azerbaijan has also managed to buy the loyalty of other Shia clerics such as Ibrahimoğlu. Altay Goyushov says the government has got value for its money. 'It is a very elaborate policy,' he says, 'on the one hand, the government buys the loyalty of Shia clerics, helping them extend their base while on the other using their images both to intimidate the local secular majority, as well as an international audience with [growing concerns about] Islamisation.' As far as Goyushov is concerned, the government wants to portray itself as the only viable guardian of secular values. Yet the ongoing crackdown against Azerbaijan's active civil society and secular democratic opposition, arrest of its well-known critics, and sentencing of the country's prominent journalists over the course of the past two years also attests to the government's fear of a democratic opposition. 'For this government, democracy is the main enemy, [and it would] enlist anybody who [can] help it fight secular, democratic civil society', says Goyushov. This vision could also explain both official and unofficial government support for active religious groups. The arrival of the top Iranian cleric Hussein Nuri Hamadani in Baku in August of this year, where he met with Shia religious leaders and followers, is simply part of the game and a message to the west. While even the US under-secretary is not invited to Azerbaijan, Azerbaijan's politicians make the time to meet Iranian clerics. Signs of secular life abound in Baku. The capital's vibrant nightlife does not fall short of the parties one can see anywhere around the world. High-end clubs bars and restaurants are open until the early hours of the morning, while the country has a tradition of drinking home-made mulberry vodka and even consuming pork. Religion is not taught in schools and religious literature is strictly controlled: distribution of unapproved religious material is subject to large fines. The National Parliament recently passed an additional new amendment to the law on 'Mass Media' (which constrains 'foreign ownership' and 'defamation'): from now on, prior to publication, any form of religious literature will have to receive an approval from the relevant executive authority. All mosques operating across the country (and there are some 2,000) must register with the local authorities. As of 2009, all religious groups have been required to register with the authorities and religious figures recertified. Protests in 2013 by conservative Muslims in support of women wearing the hijab in schools and universities failed to gain traction. Discussions around the hijab are a common occurrence, opening up a Pandora's box of grievances just as Azerbaijan's schools open for the new academic year. This year, 100 letters complaining that girls were not allowed to wear hijab to school were reported to the Muslim Union movement. Although it was possible to convince some school principals to allow girls to wear the hijab to class, in most cases girls must choose between education or religion. According to former political prisoner and theologian Taleh Bagirzade, it is impossible to even talk about forming an Islamic government in Azerbaijan. One thing that remains certain is that, in the 20 years since the Aliyev clan came to power, Baku has developed effective methods which keep all actors, whether activists, NGOs, media, opposition or religious groups, in line. With the exception of government-linked officials and extended family members of the ruling Aliyev clan, none of these groups can support themselves. A 2010 Crisis Group report described the regime's policy as having 'deliberately promoted a sense of impunity so as to ingrain self-censorship in the public and discourage any collective action.' The government's stance towards religious groups is often exaggerated for the sake of attracting western sympathy and a cover for the country's undemocratic tendencies.